Animal massage therapists are animal health professionals who use their knowledge of anatomy, physiology, and massage techniques to improve an animal’s physical well-being. Animal massage therapists use hands-on massage techniques to relax muscles, stimulate circulation, and enhance the range of motion in their four-legged clients. Massage therapists develop and implement treatment plans based on the individual animal’s needs, and may work in conjunction with veterinarians. While some animal massage therapists specialize by species (equine and canine being the most common), others work on a mix of large and small animals. Equine massage therapists have worked on a number of top-level performance horses in a variety of disciplines, from Olympic show jumpers to Triple Crown race winners. Canine massage therapists have worked on all types of dogs, from show champions to family pets. Many animal massage therapists work for themselves and travel to provide services to their clients. They may also find opportunities working at veterinary clinics, kennels, grooming salons, major pet store chains, or zoos. Some massage therapists that work on human clients expand their business to include animal clients as well. A background in working with animals or an animal related degree is useful but not necessary. A key to success in this field is developing a solid knowledge of physiology, especially muscle groups and their functions. Animal first aid training can also prove beneficial to those wishing to pursue this career. While it is possible to learn the requisite techniques as an apprentice or intern, most animal massage therapists complete one or more training programs to attain certification. Certification or some proof of professional training is required in some states. It would be wise to check with veterinary boards and departments of health for specific requirements. Equissage is perhaps the best-known training program for animal massage therapy, offering programs for both equine and canine certification. Equissage graduated its first equine therapists in 1992, and its first canine graduates in 2000. 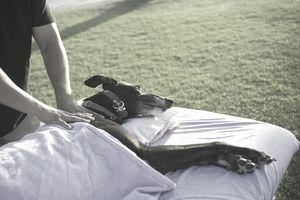 Participants earn Equissage’s canine massage therapy (CMT) certificate via an at-home course of study, an exam, and an evaluation of the student’s massage techniques. Equissage’s Equine Sports Therapy Massage (ESTM) training is offered at the Virginia headquarters or through an at-home study course. Dual Equissage certification is offered for those interested in both canine and equine therapy. The Northwest School of Animal Massage began offering certification in large and small animal massage in 2001. They offer three areas of concentration for either small or large animal massage: maintenance, performance, and rehabilitation. Two certificates are offered, with each course running about 150 hours: the Small Animal Massage Practitioner (SAMP) Certificate of Achievement and the Large Animal Massage Practitioner (LAMP) Certificate of Achievement. The salary a massage therapist earns can vary based on factors such as the number of clients, job location, years of experience and level of education achieved. With significant experience and skill, a therapist can earn top dollar for their services. Travel cost (vehicle maintenance and gasoline) should be factored in for those animal massage therapists making home or farm visits to work on their clients. Insurance premiums can be an additional cost, though discounts can be available through group plans such as the one offered by the International Association of Animal Massage & Bodywork (IAAMB). IAAMB members can obtain bodily injury, personal injury, and property damage coverage provided they can document 100 hours of professional massage training.